American officials are confirming that Iranian Military commanders have endorsed a plan to attack the United States with a strategic EMP blast that could cripple the country’s power grid for months, possibly years. The news was leaked earlier this week when Dr. Peter Vincent Pry, Executive Director of the Task Force on National and Homeland Security and Director of the U.S. Nuclear Strategy Forum, wrote a column for an Israeli news organization. He warned that American defense experts made the discovery when translating an Iranian military handbook. The news is even more troubling, since the Obama administration is in the middle of nuclear negotiations with Iran that could allow the Iranians to keep 19,000 installed centrifuges – equipment that can be used to enrich uranium for nuclear bombs. The Washington Examiner reports that the Iranian document discusses an EMP attack over 20 different times. With a relatively small amount of nuclear materiel the Iranians could be capable of launching an attack that would cause a nationwide blackout. 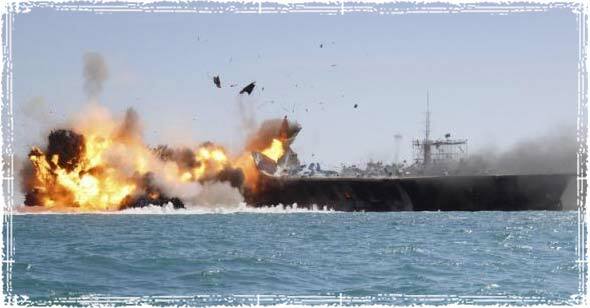 Late last month, Iranian military officials conducted military drills, named Great Prophet 9, where their military attacked and destroyed a replica of a US aircraft carrier. Iranian TV aired pictures of the mock U.S. aircraft carrier as the ship was attacked during the Revolutionary Guard naval exercises near the Strait of Hormuz. What would an EMP attack look like? If the United States were hit by an electromagnetic pulse (EMP) the damage would be catastrophic. In a matter of minutes, everything our country depends on would come to a screeching halt. From ATM’s and banking systems, to key infrastructure like power, water and gas utilities, you would immediately see failures across the board. Our way of life would change in the blink of an eye, and it would take years to even begin to repair the damage. Thus, Iran with a small number of nuclear missiles can by EMP attack threaten the existence of modernity and be the death knell for Western principles of international law, humanism and freedom. For the first time in history, a failed state like Iran could destroy the most successful societies on Earth and convert an evolving benign world order into world chaos. If the book that was translated is for real then our sen. and gongs. should declare war on iran with a first strike end all attack. Something tells me that China won’t let this happen. They are FAR too invested in American infrastructure projects. An attack like that on the US would be akin to a suicide bombing. Of course they offending country would immediately after be wiped off the map, but would it be worth it to them to inflict that kind of damage to America? 90% of the population killed? I could see something like ISIS doing it if they could, regardless of the consequences. I don’t think Iran is quite so stupid. I hope not anyway. the way to thier heaven is to kill us with what ever means they can,they do not care if they die. Agreed, I would be willing to bet in the near future that all muslims from all sects set aside their differences and join together world wide. There isn’t that much difference in iranian muslims and iraqi or afgani muslims. One group believes their leadership should come from a direct blood line of muhummad and the other group believes they should just be elected like any other politician. See how easy some charsimactic person could cause them to lay down their differences and join forces? It wouldn’t take much. This is pure propaganda. There is no way Iran has this kind of capability. If there is an EMP attack in the US it will be carried out by the same people who were behind the 9/11 attacks (no, not the Saudis). I wouldn’t discount Iran too quickly after all, a lot of them are educated here and know our ways. As far as an emp blast goes, they could team up with russia,china,or north korea. The missle could be sent on a different trajectory then changed once it reached the needed altitude to cause this emp effect. Recent polling put Obama at 50 percent! Maybe the first 50 percent of casualties will be those who endorse the current “leadership.” It could be worse and maybe a better than 50 percent good fresh start. One thing is sure, it won’t be Obama that prevents it from happening. Our only hope is Israel. Of course then we have to pray that by 2016, if we all live that long, that there are enough American Voters that are finally paying attention and will vote these maniac Democrats out of office. These are not your grandfathers Democrats. They have intimidated and otherwise got rid of any moderate Democrats from Congress long ago. Most are now Socialists and some Communists. However, the is no discounting the ignorance and stupidity of the low information voter. Even though Democrats have only abused the black community, they keep voting for Democrats in spite of being constantly manipulated. The Republican Establishment clearly does not have the stomach or the moral conviction to anything about Obama, so we are left to pray that we have a dramatic change in 2016. I am sure if Iran would launch a some king of rocket or bomb towards the USA, one of our Allies with shoot it down and if they miss I’m sure we won’t. Then Hell will open up all around Iran. Israel will destroy them within seconds of a launch towards them or us. Then we will wipe them off the face of the earth. @Prep for stuff. I’m very impressed with you, but not with your mom. Do you have any other friends that you can store food & (WATER)at? Are there places in your yard that you can bury items, or somewhere else? I am so impressed with your initiative, if you live near me in the wonderful state of Kalifornia, I would try to help you, and at least try and talk to your mom. Keep up the good work and stay informed. It is your generation that will have the major task at making this country (World) a better place to live. Prep what area of the country do you live in ? find others that think like you and start a club for the future of mankind, if you need help just keep posting and you will get plenty of information and help with your problems,,,most of us are with auh that a 14 year old is even thinking of such things even if your mom don’t. More evidence of the “9 meals away from chaos” idea. If you can’t grow food, can or otherwise preserve it, defend it, provide warmth and shelter for yourself and your family, then you will be a statistic in some future school book. If they had the capability now they would have used it. If they could have purchased it they would have. Iran is not the ones to be watching, rather, the Russians are. And we keep poking them with our economic sticks. Who would of thought? Maybe Obama? Maybe there is a plan? Probably not. If it happens , Barry will immediately surrender un conditionally ! A country with no nuclear weapons, published their “nuclear attack strategy plan” in a military handbook, and it amounted to the EMP effect, that’s been common knowledge since the early 1950’s, and was the main reason DARPA developed the internet, 45 years ago? Really? with isis cells in the USA, they could inform the cells so they put items in faraday cages, then after the grid is taken down activate, cause massive damage and then let the down infrastructure let the rest of the people turn on each other and kill themselves off. 90% decrease achieved the easy way. of course there will also be mexico wanting to probably gain land at that time and invade as well. Canada is too liberal to do anything so they will sit in their snow drifts happily living a life of solitude to the north..
My whole emergency kit (BOB) is 9 cans of viene sausage, 6 watert bottles,a lifestraw, first aid kit, handcranked flashlight and a handcranked radio, a energizer lantern( can take AA or D batteries that give it longer life, a mini lantern, 2 good flashlights,2 packs of AAA batteries,1 pack of AA batteries, 2 headlight s,pack of lifegear signal ing lightsticks,emergency blanket,emergency poncho,survival knife, mini baseball bat,toilet paper and also I weightlift. I am a 14 yr. Begginer prepper and live in the city and I never went fishing or hunting. anyone got any suggestions I could put in my bob. Keep building,,another blanket or two, another knife, maybe get a bow and start shooting, think about getting around town, if you have a bicycle and a wagon you can move a lot of stuff. If you live in a northen city think about cold weather . Iran does not need to wait for their missile program to mature to attack the US. They have several Boeing 747 and other long range aircraft that could easily imitate a regularly scheduled airline or charter flight. Fly their weapon to the right spot and altitude then detonate it over the US. The ultimate suicide bomber! This could happen very soon. I live in Michigan so does anyone know what natural disasters Michigan is prone to? You do realize this fear inducing propaganda has been used for too long now. I think it’s time to realize what’s really going on. Obama is not the real problem, in all actuality it’s those who choose to minipulate the masses by using a ridiculous dogma that they don’t believe in to advance their true agenda. I’m sick of being a piece of someone’s game.